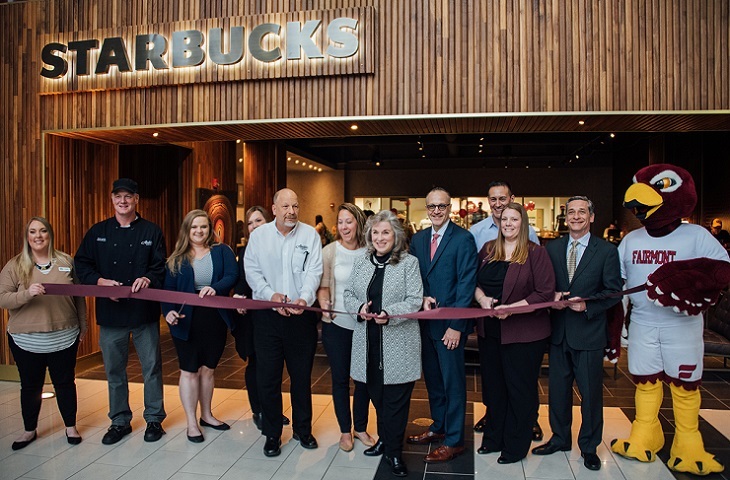 “To accommodate the commuter student population, we are proud to offer and manage this full-service Starbucks where students already enjoy a full-service Chick-fil-A, both ranked nationally in the top three most popular restaurant chains among college students,” says Joe DeSalvo, Aladdin district manager. Under the direction of Rob Lemon, Aladdin manager of retail sales, Starbucks offers a full-service menu of handcrafted espressos and blended beverages along with great tasting food items. The new Starbucks is located on the second floor of the Falcon Center’s newly renovated full-service dining hall where students enjoy an extensive menu of fresh and made-to order offerings prepared by Aladdin. Popular Starbucks merchandise can also be purchased such as pre-packaged coffee, mugs and other gifts. Starbucks provides an alternative dining experience for those craving specialty beverages, along with breakfast and lunch for eat-in or take-out. Aladdin worked closely with Starbucks, Fairmont State University, and The Thrasher Group to create a unique space on campus that provides a service as well as additional places for students to study and collaborate with each other. The Thrasher Group served as the Architect of Record on the project, ensuring that the design intent was maintained throughout construction and that the space met the building codes and the needs of the students. In coordination with Veritas Contracting, the design became a reality. “In addition to Fairmont State students and faculty, we want to share the excitement with the community at large and encourage visitors from outside campus to enjoy our family of retail of brands which also includes Aladdin’s signature brand Chilaca, authentic Mexican cuisine,” says Jeff Swaim, Aladdin director of dining services at Fairmont State. The new Starbucks provides seating for 68, is Wi-Fi accessible, and open Sunday through Saturday 7 a.m. to 10 p.m. Students can use Falcon or flex dollars, cash, credit or Starbucks gift cards. Aladdin, a part of the Elior North America family of companies, was first awarded Fairmont’s food service business in 2001 to bring exciting dining venues, quality fresh food and a high level of creativity to campus dining.